This handmade watercolor floral painting is absolutely stunning. The painting is set in a garden and it has my favorite flowers - the tiger lily in full bloom along with phlox / hydrangea. The tiger lilies are painted in those beautiful pink / orange colors. 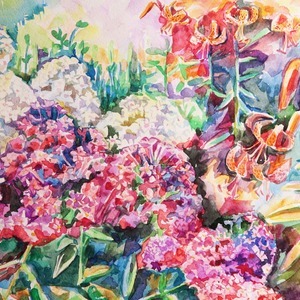 The phlox / hydrangea are painted in white and the pink / orange colors. We chose not to personalize the main design. We did personalize the coordinating design with a simple initial. The choice to personalize it yours.